To create this book, author Mike Adams built a state-of-the-art analytical laboratory with cutting edge scientific instruments for food composition analysis. In Food Forensics, he takes you on a journey of discovery by meticulously testing groceries, fast foods, dietary supplements, spices and protein powders for toxic heavy metals such as lead, cadmium, mercury and arsenic. With scientific results of metals composition listed for over 800 different foods, Food Forensics is doing the job the FDA refuses to do: Test off-the-shelf foods and share the results with the public so that people can make informed decisions about what they consume or avoid. In Food Forensics, you'll also discover the little-known truth about other toxic food ingredients such as polysorbate 80, MSG, sodium nitrite (which causes cancer), pesticides and weedkillers such as glyphosate. Adams reveals stunning, never-before-reported details of heavy metals found in recycled human waste ("biosolids") used on some crops, and he explains how industrial pollution causes mercury, lead and cadmium to end up in your favorite protein powders. Food Forensics will forever change your view of food safety, food regulators and food manufacturers. Once you know what's really in your food, you can start making changes in your own food choice that can help prevent serious disease (like cancer), eliminate food chemicals that cause diabetes, and even activate your body's natural immune defenses against infections and pandemics. Author Mike Adams is the science lab director of CWC Labs, a commercial food testing laboratory, and editor of NaturalNews.com. He gained fame as an outspoken clean food advocate and critic of the over-drugging of America with toxic pharmaceuticals. As an award-winning investigative journalist, he pursued a path of discovery into food ingredients, composition and contamination, ultimately transitioning to a food scientist with a world-class analytical laboratory he built from the ground up. "Food Forensics definitely is a 'must have' book for serious-minded researchers, healthcare practitioners and consumers, plus everyone who eats. . . . It’s a virtual 'encyclopedia' about toxins we don’t know about in our foods." —Robert Scott Bell, D.A. Hom. "Radical, irreverent, always provocative. 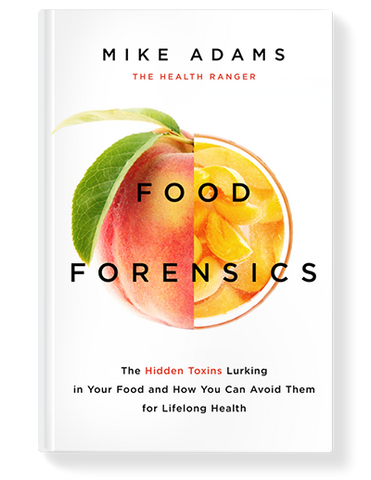 Mike Adams new book, Food Forensics, should be required reading for all the Big Food, Big Biotech apologists who continue to poison and mislead us, as well as for activists and concerned consumers." "I emphatically agree that this book is an important public record of scientific truth. An amazing job on so many levels and an absolute must-read." Explore More About Food Forensics Now!